This stuff blows my mind. Gregory Palamas (1296–135), spelled Γρηγόριος Παλαμάς in greek, was a monk on Mount Athos, a place I’ve visited with my father two times. It is a beautiful peninsula in northern Greece, scattered with old monasteries. Furthermore, only men have been allowed on the peninsula for around a thousand years. Palamas eventually became the Archbishop of Thessaloniki, which is a city I incidentally happened to live in from 1995-1996. Below is a picture of Gregory Palamas, in the form of an icon. In his early youth, my father (Georgios Kefaloukos) was also a monk on Mount Athos. There he learned the art of icon painting, and could have painted one of Palamas, although I don’t think he did. Below is a picture of my father taken on Mount Athos. When I first heard about the Math in Genealogy project, I was thrilled to find out that a Gregory Palamas, who lived long ago and was the Archbishop of Thessaloniki, apparently had a transitive relationship with people in science through an unbroken chain of mentoring (112861 “descendants” in total). I became curious, and wanted to find out which famous people he might be connected to. While Palamas was the Archbishop of Thessaloniki he mentored Nilos Kabasilas (1298-1363), who later replaced him as Archbishop. Nilos in turn mentored Demetrios Kydones (1333-1397) and this lineage of mentoring continues in an unbroken line, through many scholars and countries, until we eventually arrive in Germany and at the famous mathematician Carl Friedrich Gauß in 1799. Gauß himself mentored a few students, one of whom was Christian Ludwig Gerling (1788-1864), who went on to mentor Julius Plücker (1801-1868) and so forth. Again the chain of mentoring continues until we reach Marcos Vaz Salles, a Brazilian Tenure-Track Assistant Professor at the University of Copenhagen, which is the city I was born in… And here comes the surprising part, for me at least, because Marcos is now mentoring me, together with Professor Martin Zachariasen! Daniel Grosu, an Associate Professor at Wayne State University has managed to track the mentor lineage through Palamas and even further back to John Mauropous (990-1092), who was a scholar at the University of Constantinople. He was a Byzantine Greek poet, hymnographer and author of letters and orations, living in the 11th century AD. Other scholars have since then tracked the lineage further back to Sharaf al-Dīn al-Ṭūsī, an astronomer living in 12th century Persia. And that is where the tale ends. For now. Maybe I should start reading Bill Gates blog as well, just for more of that feel good vibe I got from reading the blog post. I not being sarcastic. Everything is relative, especially the news value of things, so this is of course only news to me. Having been too busy with life to sit down and quietly read a post that is non-technical. This is geek humor at it’s best, and is one of the funniest reactions to PRISM I have seen. 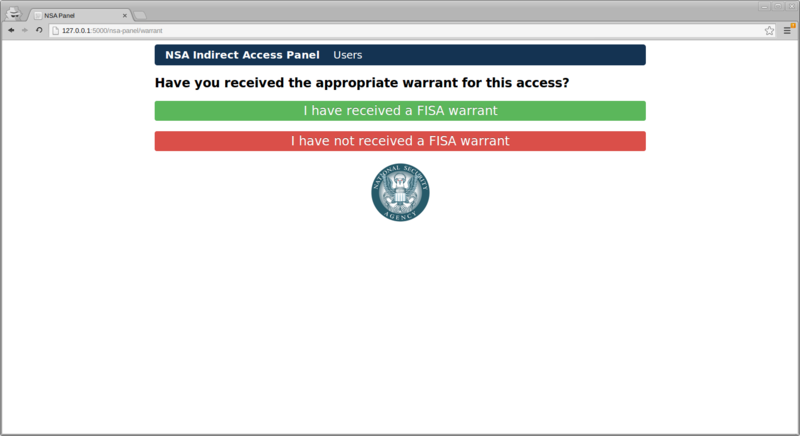 The project description simply goes: “Give the NSA free backdoor access to your Flask app”. Pasadena He says yes. Has three kids aged 6, 4 and 2 and several startups behind him or in the works, including AppIgnite. Los Angeles He says yes, but not if it is your first startup. Has one kid, perhaps aged 2. Is a well-known entrepreneur with several startups behind him. Gini Dietrich She says no, has no children. Has at least two startups behind her. Jessica Stillman She says yes, if you are willing to give up a certain bond with your kids (between the lines, is it worth it?). The post is actually more a resume of what other people have said, so open it and follow the links. In the Danish movie Broen (Om Fordomme) two groups who can not stand each other have to collaborate in order to build a bridge. The movie is visible online. I just read this blog post by Scott Hanselman (I’m a phony. Are you? ), and it was a bit of a group therapy moment. It’s nice to know that you’re not alone in something! Task parallelism is the simultaneous execution on multiple cores of many different functions across the same or different datasets. Data parallelism (aka SIMD) is the simultaneous execution on multiple cores of the same function across the elements of a dataset.